The gist at first was change in the modality of image capture and transmission—what we call “sharing” today. However, the more profound effects turned out to be in the marketing and vast technological change. And also in the rapid turnover of product due to the spin cycle of the consumer electronics industry. Innovation became more than faster and better; it became a necessary competitive element that not only pitted company against company but laid the industry open to disruptive technologies from outside. And those technologies would challenge the very core of the photo industry: witness the smartphone. 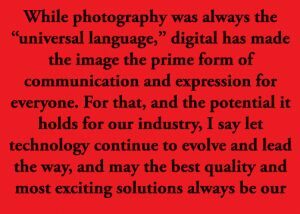 In the ensuing years after that interview, the industry has both embraced and been burned by the digital photography transition. The vast complexes of buildings and infrastructure—not to mention the staffs—of empires like Kodak and other giants of that time, including Polaroid, Konica and Agfa, are no more, though some brand names live on. Times were tough and technology rode roughshod. And it wasn’t only limited to photo companies. End users, both pros and amateurs, spent countless thousands on gear that would quickly grow obsolete. Early adopters became somewhat cynically known as the “bleeding edge.” Every few years, new technology would challenge photographers to once again relearn their craft and master new terminology and techniques. Indeed, technological changes doomed numerous start-ups that got into digital too soon. This included a well-known digital camera back company whose booth minders wore “film is dead” T-shirts at a major photo show, only to see their company go down in flames two years later. “Traditional” photo companies that did not adapt, or quite bluntly did not see the writing on the wall, took the biggest hit. CE industry companies quickly jumped in. Panasonic and Sony are cases in point. While Sony benefited from the staff of the defunct Minolta in terms of design and engineering, they brought years of know-how to the table. They are now taking on the top players in the camera field. Thank Panasonic for the MFT format and other amazing technology, including their foray into the “hybrid” camera category that combines advanced video and still capture in one unit. 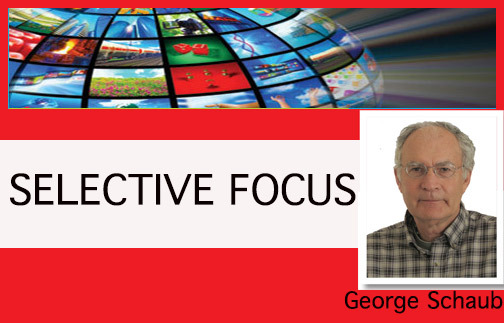 Both had the experience and capability to harness their core technologies to consumer and pro cameras. While everyone struggled at first, with some bizarre and frankly poor cameras from both traditional and CE companies, the CE entrants stuck to it. They now challenge the “old-line” companies for the top spots. Interestingly, Samsung, who made a big splash early and had the capability to develop product, came and went. They proved just because you had the CE requisites didn’t mean you’d make it in the camera marketplace. What about the industry stalwarts? 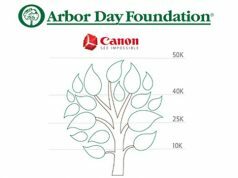 Canon, Fujifilm, Nikon, Olympus and Ricoh/Pentax maintain an important presence and have gained new adherents. Some are “step-ups” from phoneographers who desire better image quality and options. Their brands and, most important, the loyalty they built throughout the years still hold sway. Having an installed base of those with big investments in their glass doesn’t hurt. None of them stood still; they constantly adapt by maintaining a dedication to innovation and technological development, even in the face of decreasing camera sales. I’ve read those “rumor” sites about who might fall next. Thus far all the black crepe they’ve hung is idle chatter. How about market share and how it bodes well or ill for the traditional companies? According to BCN, a Japanese firm that collects data from about two-thirds of all Japanese retail stores, Canon leads the pack by a fairly wide margin in DSLRs and less so in compacts with integral lenses (where Nikon is inching closer). In the mirrorless category, BCN reports that Olympus holds a slight edge on Canon and Sony. In all this is a very competitive field that will be the one to watch in the year ahead. Amazon sales rankings show Canon DSLRs as the top sellers. However, their top 10 list contains a goodly share of Nikons. While Fujifilm ranks comparatively low in overall camera market share, their Instax line is a big hit. So much so that we recently took note of a Rolleiflex Instant Kamera TLR with the classic Rolleiflex look and support for Fujifilm’s Instax Mini film. Having tested a number of Fujifilm’s X lineup of cameras, I can attest that they continue to bring out exciting cameras (like the recent X-H1) and lenses that have built a loyal following in the enthusiast and pro arena. And Ricoh/Pentax just came out with their K-1 Mark II DSLR, with remarkable technology and image quality. According to the NPD Group’s Retail Tracking Service, last year saw Sony grab the #2 spot in the U.S. from Nikon for full-frame interchangeable-lens cameras. It is nip and tuck from here forward. Overall, CIPA reports camera shipments to the Americas to be at (DSLRs) the same level of last year (to date). They also state that shipments are about 10% higher for mirrorless. It should be noted that overall shipments of mirrorless are up more than 30% year to year. Non-interchangeable lens cameras (point and shoot) continue to be very depressed, down nearly 50%. Witness the recent dropout of Casio, another CE giant, from the point-and-shoot market. It was another clear victim of the aforementioned smartphone disruption. So many different categories, so many opinions and stats and, perhaps, too much to absorb. You definitely need a scorecard to keep abreast of the shifting trends in different regions, as well as the rapid change in sensor sizes and the revisions of models with many new sets of enhanced functions. With photokina approaching, there are hints that full-frame mirrorless models will be announced, if not necessarily available soon. Presumably, the same might hold true in many classes of DSLRs. For example, there are strong hints that Nikon’s new full-frame mirrorless model will have a new mount. Right now it’s dubbed a “Z” mount. That development is aimed directly at Sony’s full-frame models, a clear case of innovation being the handmaiden of competition. Though it’s too early to tell, we may well see the slow demise of the smaller format sensor in both DSLRs and mirrorless. We might also see the increased “hybridization” of digital cameras, that is, enhanced video capabilities in previously “still-oriented” models. All of the above might seem as if I am pulling for the traditional camera companies. Well, perhaps I am, being raised in that “culture” and having many friends and associates in that realm made throughout the years. But at the end of the day, I am a big fan of photography. In addition, I personally jumped right into digital very early. I watched as digital first stumbled along and very slowly developed into a marvelous form of expression. I’ve witnessed how today it allows us all to make images that we only dreamt of. Images we really never imagined possible. It spawned new areas in printmaking that allowed users to escape the fumes and confines of the darkroom. Moreover, it helped people create exciting new ways to save and share memories, like photo books and online sites. It also led the way toward new areas for the industry to explore. They include virtual reality, immersive 3D and drones that allow us to see from above. Also, wearable “hands off” cameras we can take along for the ride anywhere we go. 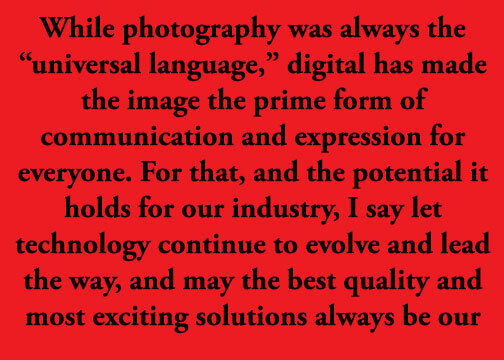 While photography was always the “universal language,” digital has made the image the prime form of communication and expression for everyone. For that, and the potential it holds for our industry, I say let technology continue to evolve and lead the way, and may the best quality and most exciting solutions always be our goal. A personal word, if I may. Because of the time between writing and having this column published, this is my first opportunity in these pages to pay tribute to Chuck Westfall. Long a dear friend, and a mentor to many, including me, his passing was greatly saddening. Chuck and I shared many things on a personal level. Because of this closeness, he was very compassionate and helpful during my wife Grace’s struggle and eventual passing due to cancer in 2012. As he went through his battles in recent years, we kept in touch. We always shared a few moments of understanding each time we met. My respect for him was always strong. I frankly marveled at his depth of knowledge and ability to walk me, and others, through the intricacies of cameras, lenses and more, despite how complicated they first seemed. He was a true gentleman. He was a courageous, rare and greatly appreciated person, and one who I will always think of with gratitude, and miss.